In a small bowl, dissolve yeast in warm water and set aside. In a large bowl mix milk, sugar, melted butter, salt and egg. Add 2 cups of flour and mix until smooth. Add yeast mixture. Mix in remaining flour until dough is easy to handle. Knead dough on lightly floured surface for 5 to 10 minutes. Place in well-greased bowl, cover and let rise until doubled in size, usually 1 to 1 1/2 hours. While the dough is rising. Place chopped apples in a sauce pan over medium heat. Add apples, butter, and cinnamon. Cook until sugar is dissolved and apples are soft. Add chopped walnuts. Stir well and place in a 9×13 baking dish. Once dough is doubled in size, punch down dough. Roll out on a floured surface into a 15 by 9-inch rectangle. Spread melted butter all over dough. Mix sugar and cinnamon and sprinkle over buttered dough. 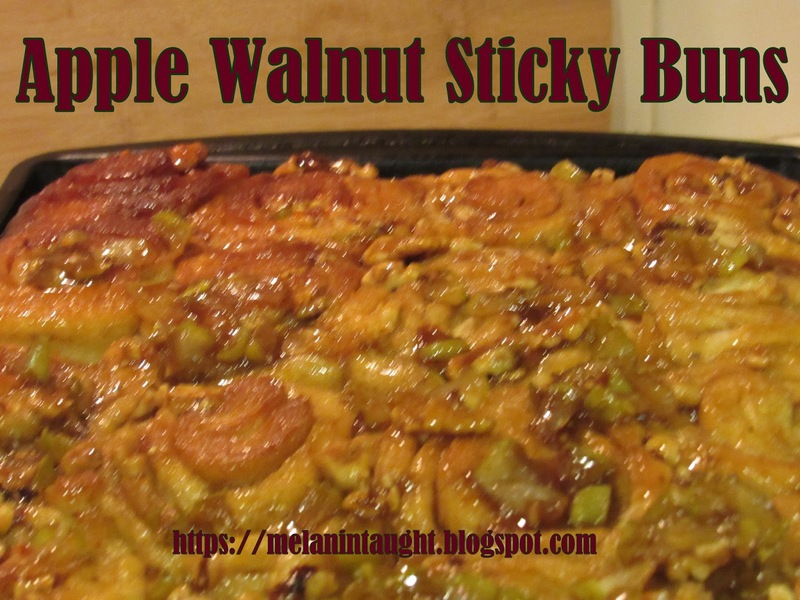 Sprinkle with walnuts, pecans, or raisins if desired. Beginning at the 15-inch side, role up dough and pinch edge together to seal. Cut with a serrated knife into 12 to 15 slices. Place into pan cut side down. Place cinnamon roll slices close together in the pan and let rise until dough is doubled, about 45 minutes. Bake for about 30 minutes or until nicely browned. Remove from oven and immediately flip onto a serving dish. Allow to cool a few minutes and serve while still warm.